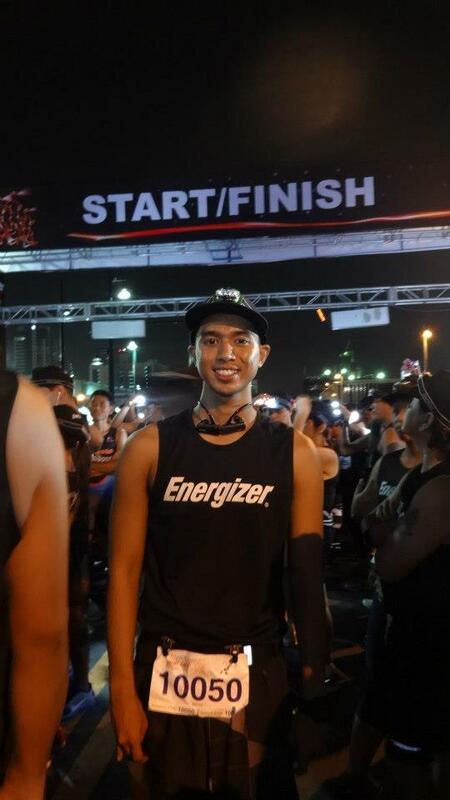 Energizer Night Run is a one of a kind race held at night with runners using a headlight so they'll be able to see the race route. 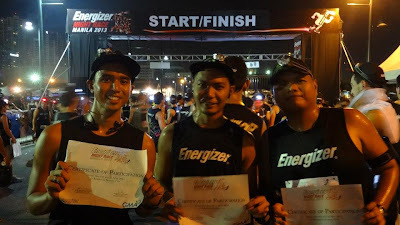 Runner's World Philippines featured this race as one of the most unique races in the country. This year's event was held on May 4, 2013 at 7:30pm. This day also happens to be by runniversary (anniversary in joining running events) and my first night race. My running buddy, Neil, mentioned joining this race to me during one of our short runs and upon checking my calendar, it coincides with my running anniversary (aka runniversary) so I registered for the race, too. My training plan says I should run around 8km so I choose to run 10km. 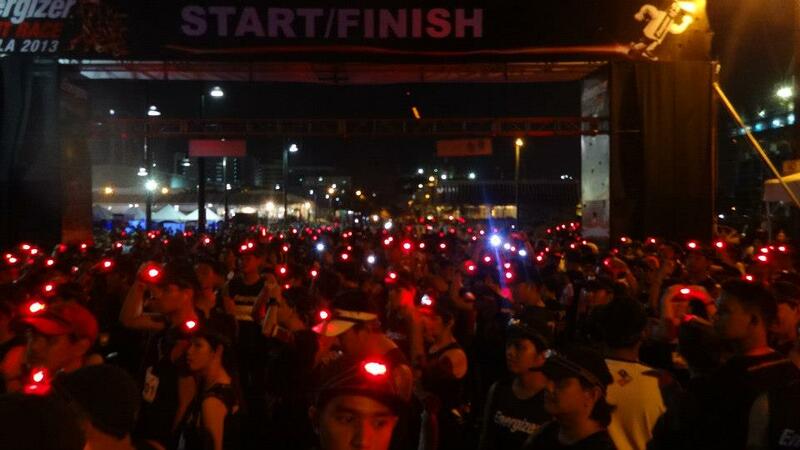 This event also happens to be my first night run event. I joined an afternoon run once but it ended before the sky turned to night so I was in for a different experience. 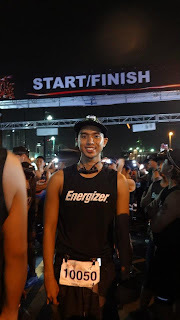 I am still training for another marathon so I skipped doing runs to achieve a 10k PR so I wasn't really serious in achieving a sub-60 finish. But I wanted to try it out. Neil is faster than me so I asked him to pace me into a PR. But I was ready to finish the race on my own pace. This is my first night run so I had no idea how early should I leave home so I left the house at around 5pm. I was short on cash that day so I opted to commute with jeepneys and buses. Leaving early allowed me to commute with cheaper fares. Also, I read the route map wrong and I headed to the usual gun start venue the one near Honda. As it turns out, the assembly are is near Mercato. 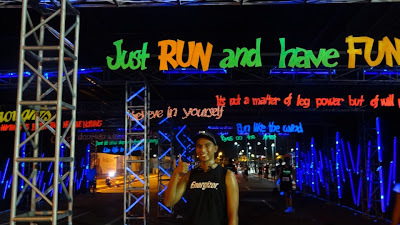 Thanks to Kamote Runner who tweeted me to go to the right direction. Leaving early has it perks as I was still early for the 6pm assembly. I met PEx friends, Mark, Marlon, Jeremy and photographer for the day Pier, who passed by BGC and help us pass time by taking our photos. Before heading to the run, I laid out the clothes to wear on this run. I chose a black singlet instead of the event singlet and was planning to not use a cap to hold the headlight but as I reviewed the rules. 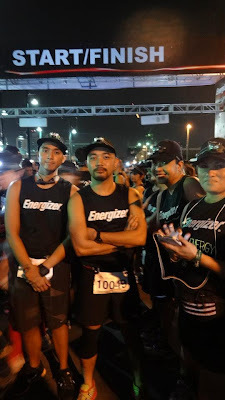 Runners without the singlet, cap and headlight will be disqualified in the race so I wore the event parapernalia with my usual running attire. As I was checking their FB page, this apparently wasn't a strict rule. (Sana di niyo na lang nilagay sa rules). I should have worn my first choice outfit. 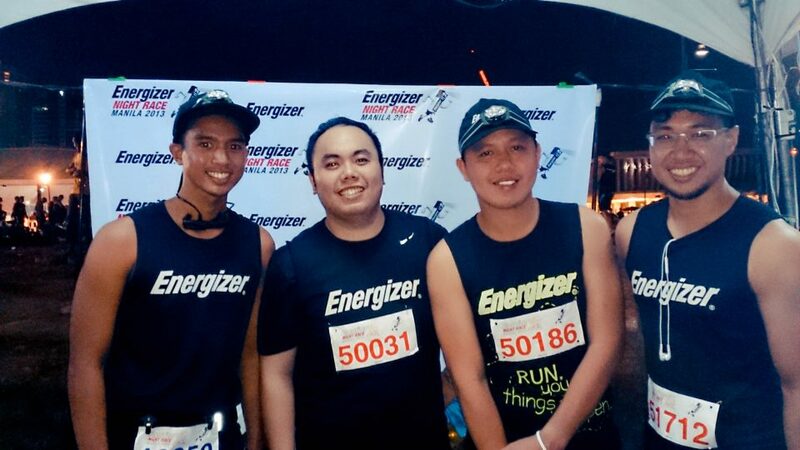 Anyway, the event singlet didn't provide me any discomfort so it was okay after all. Our race kit came with a glow in the dark fabric paint. I like the simple black design of the singlet so I didn't write on mine. On my way to the venue, I saw all of the bus passengers who were joining the race had decided to write on theirs. I felt out of place but when I got to the race venue. Di lang ako ang hindi nagpa-uto. Anyway, gunstart was on the dot on 7:30pm. I didn't took the run easy as I was trying to keep up with Neil's pace who was like an excited kid running criss cross on the crowd of 3,000 runners. (ambilis na tapos saan saan pa sumusuot...) It paid off as I was able to run in 9:45 minutes per mile pace, faster than my 10:00 minute per mile sprint average. It was (still) hot on that day so I was dripping with sweat trying to keep up with my pacer's speed. I was able to follow his pace until hills came. Then, I was running at a slower pace but I could still see him and trying my best to follow in his pace but more hills came and at 4km, I lost my pacer. Good thing I found him again in that turn around point and he waited for me a little and then I was just right behind him. He was in the front of the pack but I still saw him so I continued to pushed myself to keep up with the pace. 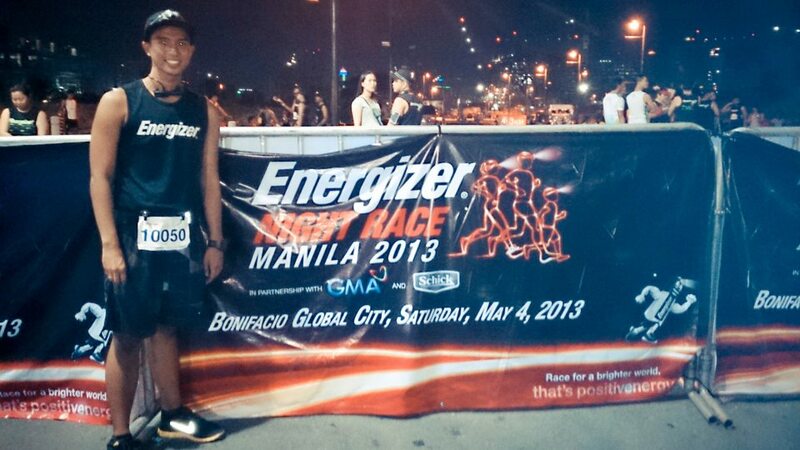 Three kilometers later as I readied myself for pushing my limits more. But it was already the finish line. My GPS read 4 miles and I was expecting the race to be 6 miles. As it turns out, the marshals weren't doing their job and a lot of runners had failed to do an additional loop causing us to finish the race running only 7km. My garmin told me I finished 4.14 miles in 40 minutes. Sub-60 indeed. 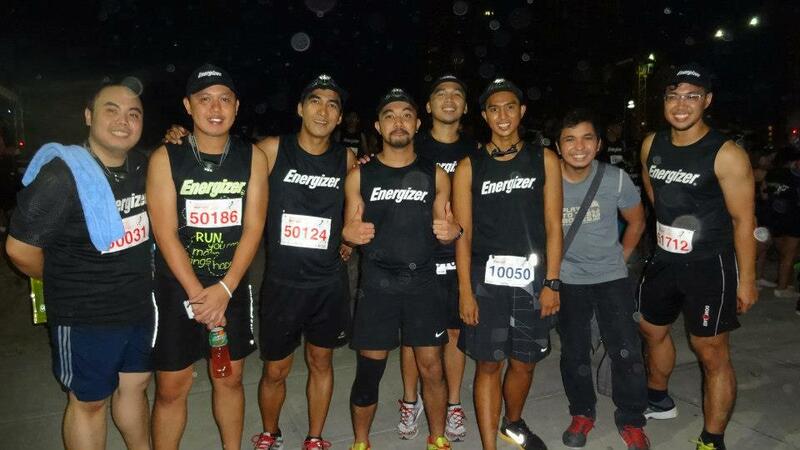 Too bad I didn't run 10km as I was part of the group that failed to do an additional loop. 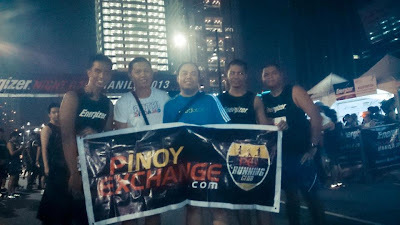 While taking our pictures at the finish line, I found PRC friends, Dom and Enrich finishing 5km (or should I say 4km? OO, kulang din sila sa distance). Then, we found Mark and company and had our photos taken with the PRC banner. Then, we walked to Market Market and met other friends for dinner and coffee. 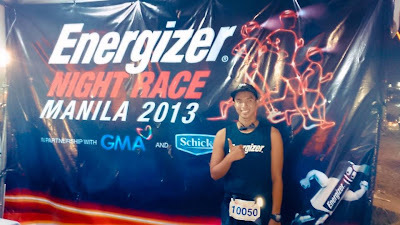 Energizer Night Run is a unique experience but the run race part of the event was a big failure. They have numerous marshals on the route but none of them had any use. They were just standing there. They look like bouncers at a bar so they were big and easy to find. But they were useless. 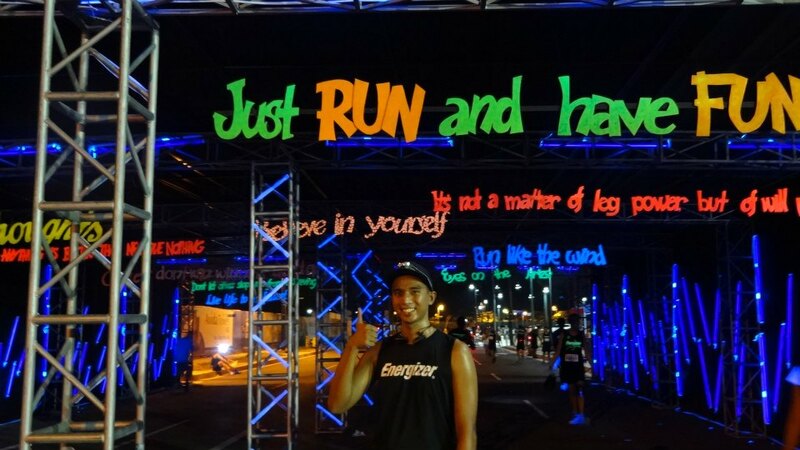 I saw an elite runner asking or directions but the marshals were clueless on where he should go. It turns out that we missed a turn so the posters to show the right way wasn't there. Failing to provide a 10km route in a 10km event is a big thing to miss. Organizers should learn from this mistake. Hydration was also lacking for 3,000 runners. Each hydration station was just a small table with unfilled cups. I volunteered for one run once and with less than 300 runners there were 3 tables of filled water cup. Their hydration is also a failure for the organizer of this race. 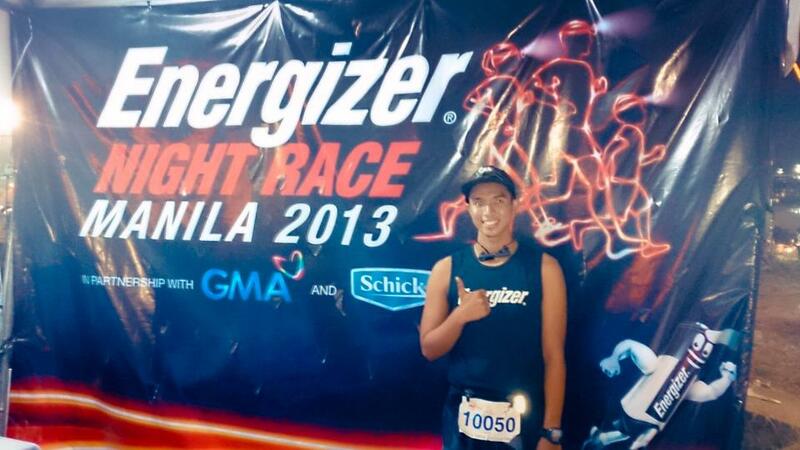 A redeeming factor of the race is the headlight freebie that costs P900 comes free with the kit. The Assembly area had lots of activities that was fun for the runners. The Baggage was organized well with the staff helping each other and bags arranged in an orderly manner. Congrats to all the finishers! I am now running in these kind of events for 2 years. I had ran a marathon. I'll be running another one soon. I had broke PRs and set new ones. I met new friends. I gained a lot of experience and confidence. Shout out to the running community! 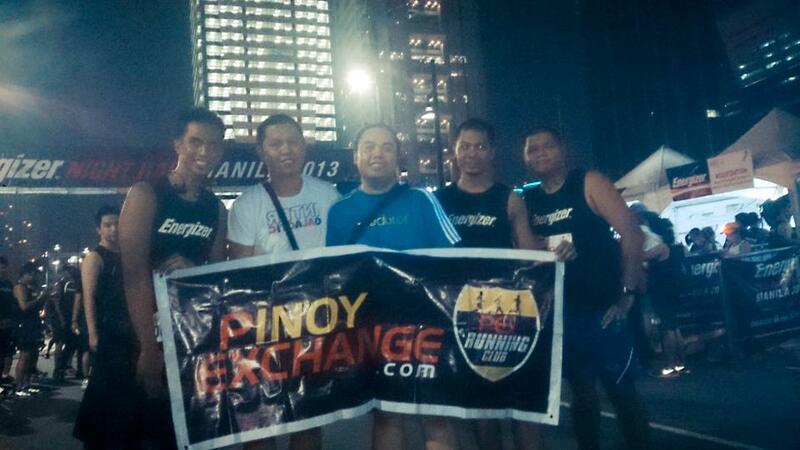 Especially to my teams: PEx Running Club, Team Titans and Ayala Triads. Thanks for making me love running! Enjoy blogging (when you start)! 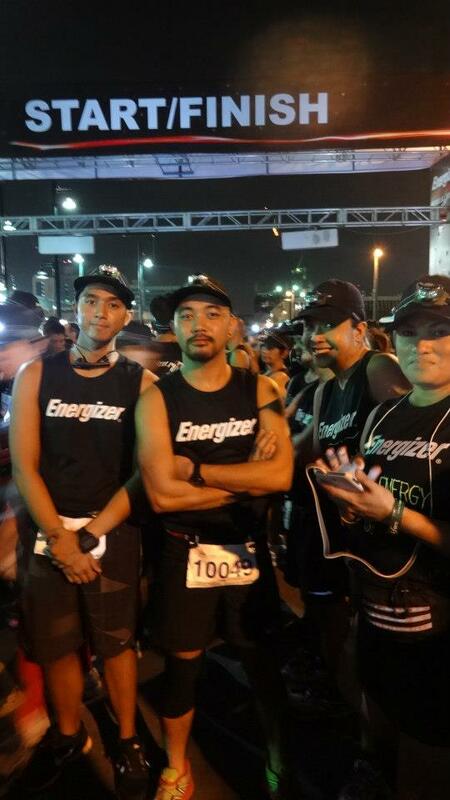 i happened to have had coffee with you after the energizer run and stumbled on your blog but i am not a stalker too. wait, i know you! lol! your race review is too kind. hehe! still wondering why known successful races still fail a second or third time around. they should already have that "success formula" at hand. The event was still fun.